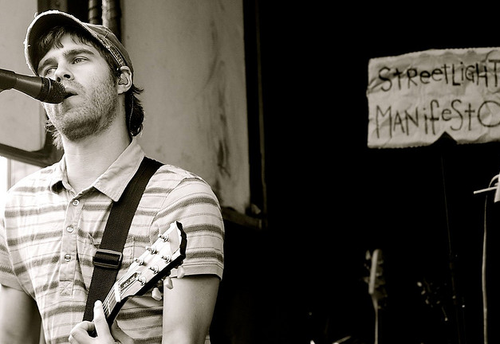 Streetlight Manifesto embodies everything that's right about ska-punk. Their brass section is bold and brash, drummer Chris Thatcher is relentless behind the skins and although they will never one up modern ska classic Keasbey Nights, the band has motored its way to an impressive discography. But lead singer Tomas Kalnoky is the soul of the band, and though he's written some swinging ska tunes, the heart of the songs he's written shine with his acoustic side project, Toh Kay. Imagine if his Bandits of the Acoustic Revolution project was softer and sadder, or if Streetlight Manifesto stripped their sound to its barest bones. Brian Fallon's outlet for making "nighttime music" that didn't fit with The Gaslight Anthem's Jersey barroom sound was the Horrible Crowes. Toh Kay is the same kind of idea behind Kalnoky's Streetlight Lullabies. The barnstorming "Watch it Crash" morphs into a plaintively strummed meditation on isolation and fear. "Dear Sergio," a rousing hallmark of Keasbey Nights, slows down into a heartrending rendition complete with a whistling solo. "The Big Sleep" turns its sing-along chorus on its head to make it a lullaby. Its not a collection of sleepy songs to sink listeners into a stupor, nor is it a quickly hashed out collection of acoustic b-sides used as a record label cash grab. It's Kalnoky inviting listeners into a snapshot of his writing process and how he wanted them to be heard. Toh Kay has taken to the sidelines as Streetlight Manifesto rollicked its way through Warped Tour, but my fingers are crossed that Kalnoky finds the time and inspiration to continue with the acoustic project. As adrenaline-pumping and skanking-worthy as Streetlight Manifesto jams are, sometimes we all need a lullaby to get ourselves to sleep.